Yves here. The ongoing effort to eliminate or considerably degrade the level of service provided by the Postal Service, to the benefit of UPS and Fedex, is moving along at a slow enough pace so as to largely escape the attention that it deserves. This post goes through the detail of how numbers are being cooked to aid in the campaign against the Postal Service. Angry Bear writer run75441 catches a Reinhart/Rogoff level error on a computational level in a recent Brookings paper by Elaine Kamarck that argued for a radical dismembermemt of the Postal Service. Worse, she misrepresents her own data to make the claim that the apparent woes of the Postal Service are fundamental, and not the result of the unheard-of retiree prefunding obligations imposed on the Postal Service. The author Steve Hutkins is a literature professor who teaches “place studies” at the Gallatin School of New York University. He has no affiliation with the U.S. Postal Service—he doesn’t work for it, nor does anyone in his family. Save The Post Office (his website) provides information about the post office closings and consolidations that are taking place, the historic post office buildings that are being sold off, the efforts people are taking to protect their post offices, and the things citizens can do to save their post office when it ends up on the closure list. Kamarck’s thesis is that the Postal Service is going through a “crisis of obsolescence,” its financial losses are unsustainable, and “the political system is stuck and unable to do anything about it.” The thing to do now, concludes Kamarck, is split the Postal Service in two. One organization would fulfill the universal service obligation by delivering market-dominant mail. The other part would be privatized and take over competitive products (Priority Mail and package shipping); it would also be given the freedom to expand into new areas of business now prohibited for the Postal Service. The article prompted several critical responses, including pieces by Dave Johnson in Crooks & Liars and Zaid Jilani in AlterNet. Rein also did a follow-up article in the WaPo — “Why sell off the Postal Service if it’s making money?” — in which she goes more deeply into the conflicting explanations for the Postal Service’s financial problems. One of the main issues in the debate has been the Retiree Health Benefit Fund (RHBF). The critics of Kamarck’s paper (and Rein’s column about it) argue that were it not for the RHBF prefunding established in 2006 by the Postal Accountability and Enhancement Act (PAEA), the Postal Service would not have been posting huge losses. The core of the financial problem facing the Postal Service is the requirement to fully fund decades of future retiree health costs with ten annual payments of about $5.6 billion, an obligation imposed on no other business or government agency. Kamarck anticipates this claim about the RHBF, and her paper tries to set it aside. In so doing, however, she makes an error that’s worth looking at in some detail. Many believe that the prefunding requirement for retiree health benefits accounts for all of the Postal Service’s financial problems. Although the prefunding requirement does account for a large share of net losses, retiree health benefits caused $22,417 million in expenses out of a total net loss of $5.5 billion in fiscal year 2014. Kamarck is trying to make the case that prefunding the RHBF does not explain the Postal Service’s huge losses, which she thinks can only be explained by the declining mail volumes caused by the Internet. To make this point, she says that prefunding accounted for $22,417 million (or $22.4 billion) of the $5.5 billion loss in FY 2014. This doesn’t make sense. She’s trying to show that the RHBF expense doesn’t account for such a large portion of the net loss, but according to her numbers, the expense was four times greater than the loss. That’s not just illogical, it’s wrong. The RHBF expense in FY 2014 was not $22.4 billion. It was $5.7 billion, as stated in the USPS 10-K report. And the expense did not account for just a portion of the $5.5 billion net loss. It accounted for all of it. If it weren’t for prefunding, the Postal Service would have posted a profit in 2014. Anyway, it seems like a pretty minor mistake, hardly worth noting, but it goes to the heart of Kamarck’s argument. She’s trying to refute the claim that prefunding explains the Postal Service’s financial problems, but the number she presents is wrong, and that’s all she has to say about the claim. If prefunding really is the cause for the Postal Service’s financial problems, the solution is obviously to fix the prefunding — not sell off and privatize the competitive products business, the one area that’s actually growing. In other words, the Postal Service did not pay $22.4 billion into the RHBF as required for 2011-2014 (it defaulted on these payments), so the total for these unpaid obligations appears as a liability for retiree health benefits in the table. The $22,417 million cited by Kamarck is the cumulative expense for four years, as of the end of FY 2014, not the expense for FY 2014 itself. Kamarck is wrong on the larger point as well. 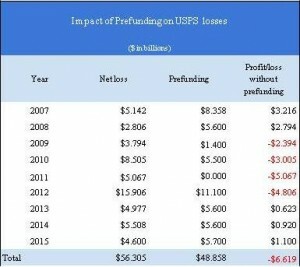 Prefunding is clearly the primary cause of the Postal Service’s net losses, and to a significant extent. Kamarck acknowledges that the “prefunding requirement does account for a large share of net losses,” but she doesn’t say how large that share is. The following table shows what’s happened since prefunding began. It shows each year’s net loss, as reported in the PRC financial analysis (p. 26), along with the prefunding payment for the year and what the profit or loss would have been without the prefunding. The prefunding for 2007 includes $5.4 billion for the first annual RHBF payment and another $3 billion transferred into the fund from an escrow account, (An earlier version of this article neglected to include the escrow transfer, but it is included in the $5.1 billion net loss, as explained in the 10-K report for 2007.) The unusually large net loss in 2012 was due to the fact that the Postal Service was permitted by Congress to skip the RHBF payment in 2011, but then owed a double payment in 2012. The figures for FY 2015 are estimates based on the first eleven months of the year, as reported in the USPS financial report for August. As the table shows, over the past nine years, the Postal Service has posted losses totaling about $56 billion. Almost $49 billion of it — 87 percent — was due to prefunding. Over the past nine years, there were four years when the Postal Service would have posted a loss if it weren’t for prefunding — the years of the Great Recession and its aftermath. In the two years before the economy tanked, the Postal Service would have shown a profit if it weren’t for prefunding. In 2013 and 2014, with the economy improving and postal revenues stabilizing, the Postal Service would again have shown profits if it weren’t for prefunding. The same will be true for FY 2015. As of September 1, 2015, eleven months into the fiscal year, the Postal Service had a net loss of $4.1 billion, including a RHBF expense of $5.2 billion. Depending on the size of the workers comp adjustment for September, the Postal Service will end the year with a net loss of something like $4.6 billion. But without the RHBF expense, it would show a profit of about $1 billion, about the same as last year. Kamarck writes that “many believe that the prefunding requirement for retiree health benefits accounts for all of the Postal Service’s financial problems.” No one believes that prefunding accounts for all of the financial problems, but clearly it accounts for a huge part. This is not a matter of belief. It’s a fact. Congress should have fixed the prefunding problem back in 2009 or 2010, as soon as it became clear that the size of the payments was unmanageable in a recession. Unfortunately, privatization advocates in Congress (like Darrel Issa) wanted to use the crisis as justification for legislation designed to dismantle the Postal Service. Fortunately, there were others in Congress, Democrats and Republicans, who saw the value of having a vital public postal system. That’s why there’s been a political stalemate. But Congress should never have imposed the prefunding payments to begin with. It’s worth recalling how that happened. In 2002 the Office of Personnel Management (OPM) determined that the Postal Service was overpaying billions of dollars into one of its pension plans, but reducing the pension payments to the Treasury would have had a negative impact on the unified budget of the federal government — something that the Bush administration would not permit. So when PAEA was winding its way through Congress, a deal was hatched between the bill’s creators and the Bush administration, specifically the Office of Management and Budget (OMB). Rather than paying for retiree health costs on a pay-as-you-go basis, as it had always done and probably could have continued to do, the Postal Service would begin setting aside funds for future retirees, decades in advance. The idea for the fund may have come from Postmaster General John Potter, who in 2003 recommended to Congress that a different pension overpayment (involving postal workers who were vets) might be transferred to a new Retiree Health Benefit Fund. It was the next best thing to getting a refund on the overpayment, which Potter knew Congress would never approve. The Postal Service’s proposal to create such a fund is analyzed in more detail in this 2003 GAO report, which explains how the plan would be “scored,” i.e., how it would impact the federal budget. Three years later, Congress created the RHBF to address a different pension overpayment problem. The overpayments were essentially shifted to the new fund, and they had to be as large as they were in order to offset the reduction in pension payments. The payment schedule for the first 10 years was established primarily to make the PAEA budget neutral, responding to the concerns of the Office of Management and Budget at the time the PAEA was passed, rather than corresponding to actuarial requirements or financial conditions at the Postal Service. There was no urgent need requiring ten years of huge RHBF payments. If Congress thought that it was a good idea to prefund retiree health costs, it could have spread out the liabilities on a 40-year amortization schedule, as Dan Blair, then the Acting Director of the OPM, had recommended in testimony to Congress in 2005. But Congress was using the new fund to solve the pension overpayment problem, and small RHBF payments wouldn’t have solved the problem. USPS Inspector General David Williams tells the same story about the origin of the RHBF in a letter he wrote to the GAO about one of its reports expressing concern about postal liabilities. Congress and the Bush administration created the prefunding problem, and one day Congress will have to fix it. The latest bill proposed by Senator Tom Carper, one of those who helped craft PAEA, tries to do exactly that. It would eliminate the existing payment schedule, cancel any outstanding payments, reduce the prefunding goal to 80 percent of projected obligations, and amortize payments over 40 years. Congress should have passed a bill five years ago saying just that and only that. Perhaps then we would not have had to endure the endless stream of news articles about billion dollar losses, bleeding red ink, defaults on payments, and the obsolescence of the postal system. Perhaps then the Postal Service might not have found it necessary to increase rates, lower delivery standards, close post offices and plants, sell historic buildings, and make draconian cuts to its workforce. And perhaps we would not be hearing from the Brookings Institute about why it’s a good idea to privatize the Postal Service. This entry was posted in Banana republic, Doomsday scenarios, Dubious statistics, Guest Post, Politics, Privatization, Ridiculously obvious scams on December 21, 2015 by Yves Smith. In what world is “extend & pretend” on unfunded liabilities sound policy? An obligation that looks specifically designed to undermine the Post Office. In what world is that sound policy? In the USA of today, sadly. Of course, this is all done for corporate and 1% gain. Just ask DiFi about her hubby’s made a killing on buying up USPS properties that’ve been closed, for example. This isn’t about GOP greed, alone. It’s ALL of them, Katie. I’m not sure that I understand your comment. What is “extend & pretend”? Are you saying that the Postal Service should provide financing now for retiree health benefits approximately 50 years into the future? If so, can you please provide examples of private corporations that do this for their retirees? How many private corporations even provide health benefits for retirees in the age of Medicare? GE’s unfunded health care liabilities are about $10 billion. But GE has positive cash flow well over $20 million per year. If the unfunded liabilities were huge relative to conceivable cash flow, the credit markets would shut GE out and the company would have to go bankrupt to shed the liabilities. The post office has billions in unfunded liabilities and no plausible path to cash flow. I gather you either did not read the post or don’t understand it. If you continue making comments that misrepresent the underlying facts, as you have in the past and persist in doing, you will be banned. We do not tolerate commentors willfully giving misinformtion. It has been stated repeatedly that the Post Office “crisis” is trumped up because it is based on the Post Office being required to “prefund” its pension obligations far further in advance than ANY pension fund. In what world are 100% fully funded pension and retirement funds a requirement? Most actuaries consider 80% to be fully funded. I do not know of the private sector funding at 100%, no states do it, the federal government does not do and indeed they use the USPS funds to hide deficits, the military doe not do, etc. I can only think of one program which was fully funded for 30 – 40 years, Social Security. Congress has been whining about having to pay the TF back. The problem here is too much income going to capital gains and not payroll wages which is subject to payroll taxes. Run – 30-40 years? According to CBO it is 13 years…..
My understanding is that there is no problem with the pension / retirement fund. It’s the funding for the future health benefits for retirees that is bankrupting the Postal Service. In another comment I asked for examples of private corporations that do this. Nobody answered, which suggests that there aren’t any corporations that do this. If there are any, we can be certain that they don’t fund health benefits 50 years in advance. This process is just a gimmick to increase profits for UPS, Federal Express, and the parasites who make money from the sale of Postal Service assets. And the Seattle Squid may be starting its own air cargo service, this undermining UPS. The point that should be made in all caps is that the pension costs are SUNK COSTS. Privatize the post office or don’t, the costs don’t go away. But of course, if you take them off the books of the privatized entity, which they will for sure do, then it will appear much more profitable. It’s all privatization theater. It’s amazing how often they get away with this. The Big Three auto companies (and every other old line manufacturer) have for 40 years used their excessive labor costs to justify outsourcing and relocating production to low cost locations, even though the largest portion of the excess was and is sunk pension and health care benefits for retirees. When you hear it costs them $70/hour for unionized labor, at least $20-$30 of that is already sunk. Then, after they move work out, the number of hours worked at the old facility goes down, and so the hourly labor cost goes UP, because they amortize the same costs over fewer hours. Thanks for making a point I constantly harp about. Direct Labor cost is not the issue as well as Materials. The issue is the Overhead which all companies go overseas to avoid. Inversions are just another way to avoid it. Delphi’s Miller’s and his $70/hour was a sham. Thanks for the continued coverage of the campaign to break the post office. The post office is one of the enumerated responsibilities of government in the constitution. It is one of the dull but useful foundations of our economy. Even if it were run at a loss it would be needed. But it can be revenue positive. If we implemented the proposal to provide banking services to customers the commercial banks don’t want through the post office, that could be very profitable for the government. And yes, I understand that Brookings is claiming a revenue shortfall based on a miscalculation that may well be intentional. I trust your accounting and finance expertise. But regardless, even at a loss it would be worth paying for because this is part of what makes us the US. It is part of what makes a stable culture. And if more revenue is needed, we haven’t begun to explore the available options. How will Senator (D-CA) Diane Feinstein’s husband Blum manage to extract more profit from the Postal Service, after their tawdry post office scam? NC readers, to be very clear on this article. Steve Hutkins wrote it from his blog “Save The Post Office” (link included in the article). I swap emails with Mark Jamison a retired North Carolina Postmaster (and a veteran like I am) and he introduced me to STPO and Steve. From time to time, I will post some of Marks or Steve’s words to Angry Bear. Yves has been kind enough to pick this up from Angry Bear giving the issue greater exposure. I am very grateful she does this. Thanks Yves! It is clear. It is also clear that you are doing a public service run75441. Compliments. Further, looking at the history of the U.S. post office, and of government-organized postal systems all the way back to the Persians, let’s also admit, loudly, that a main purpose of a post office is to knit together a large country. This crisis isn’t just a manufactured fiscal mess. It is also a sign of the decline of our civilization. A country with means such as ours, destroying a postal system? When Franklin and others realized its necessity and worked it out during an era when the roads were atrocious and ships were slow? Thanks again to you and to Yves, who has been on this beat for some time. If the purpose of the USPS is to knit this large country together (and I think it is), then I think the USPS should, and perhaps given enough and appropriate pressure from We the People could, provide very competitively priced Internet service to all Americans. I should have more on this topic from other sources I was directed to by the author. Privatization – Some (chosen) hedge fund will take the USPS private and claim the fully funded retirements as their own buyout divided. It’s been done before. Looks like a power grab for FedEx & UPS. US Post office already works with FedEx as final component of package delivery in some cases (from my own experience). Bank ATM at Wells Fargo in Texas stopped carrying stamps Every time I go to post office there is long line for stamps & shipping. Wasn’t it ten years ago that US Post Office brought in new mgmt that installed giant equipment to improve mail service & laid off thousands. And Congress is demanding upfront cash for retirements when most delivery corp. like FedEx & UPS do not have the same requirements. When considering how much help the Post Office gives the North Pole at this time of year, I conclude that Ms. Kamarck is likely to fine herself on the ‘naughty’ list for wanting to dismember the Post Office. This is not a snark. .49, FORTY NINE CENTS is the cost of a postage stamp which will carry a Christmas card or letter by jet across the country from East to West coast in a day and have it delivered in about 2 days after that, unless you live in the middle of nowhere. That might take a whole week. Fedex charges what $20 or $30 to deliver anything at all!!!!!!!!!!!!!!! And of course, Fedex has a huge contract with the USPS to deliver to all of the places it does not want to go to, just like big electric companies don’t want to go into rural counties, hence the need for rural electric coops. The market is never deep enough for profits across any nation, only the big fat low hanging fruit gets picked and USPS does the dirty work for the areas to far and few to serve by Fedex. 49 CENTS for a letter! What costs 49 cents anymore. The USPS is giving away written communication services for the public at that price. The Post Office is beyond being a bargain if you are a cheapskate and only care about you costs. Anyone sending Christmas cards by Fedex? What’s really freaking the conservatives out is that the prefunding mandate was intended to destroy the Post Office and pave the way for privatizing it. But it’s not going to work; the Post Office has only one more year of catch-up payments and then it’s basically back to pay-go. No doubt they are horrified at the prospect that the *one* large company in America which has truly fully funded all its future payments is a public company. Even more horribly for them, it’s going to be tremendously profitable starting in 2017. So instead of dancing on the grave of the public Post Office, now they’re going to face an endless litany of “why can’t private enterprise run itself as well as the government Post Office?” It’s going to be a tough thing for them to answer, as pretty much nothing will come close. So now they’re desperately, urgently, looking for ANY way to squeeze out a last-minute kill of the Post Office before it grinds their ideological nonsense into the dust. Fortunately, their chances are slim. Get ready for a lot of, “we have to sell it, to save it” stories in 2016. Doesn’t matter that it’s nearly caught up on pre-funding retirement benefits for employees who haven’t even been hired yet: the neo-liberal establishment will find a new casus belli to use to attack Zippy. And what happens to the pre-funded pool if/when USPS is privatized? When the American voters finally understand the Rethuglican Party is the spawn of Satan, there may be some hope of saving our country.